After two weeks without some real rock I feel like jumping out of my skin...fortunately the temps have become better in the last few days and by this weekend things should be climbable across much of the lower eastside of the Boulder Batholith...first session to the Benchlands may even be order. Earlier this week, Conrad stopped by the office and gifted me one of the coolest pairs of hightops I've ever seen. 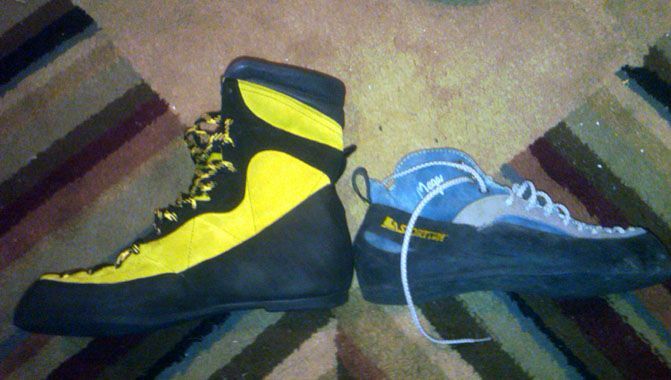 In the mid-90s Koflach made a prototype rock boot to go inside their alpine boots...while the combo idea didn't pan out, the resulting hightop is pretty badass. I'm pretty psyched on giving them a go...quite the armor for the ankle and shin. Thanks again Conrad! I don't ever recall seeing the Koflachs before, unless they were in the shells in an ad or review--either way, good score; should be interesting to see their durability. They look top rate and bad azz!